Our last day of work! 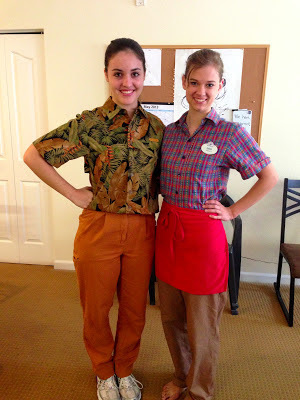 As many of you may know, I participated in the DCP with one of my best friends. If you have seen some of our video blogs, she's the other half of Sara Squared! 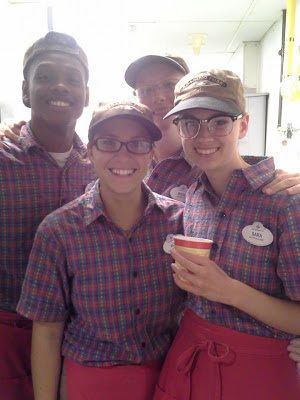 Many of you have been asking to hear about what it was like to work at the Wilderness Lodge! Well, here's her story! 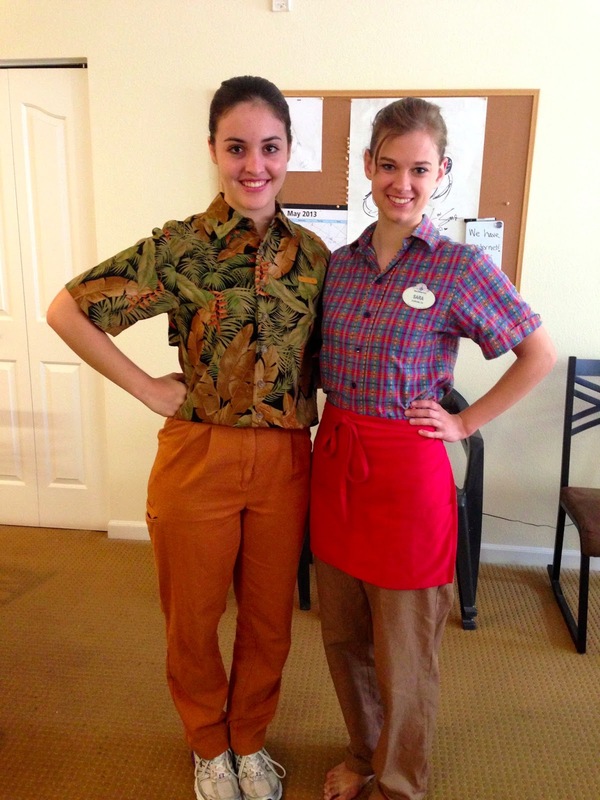 I worked in Quick Service Food and Beverage at the Roaring Fork in the Wilderness Lodge. I LOVED IT. Salad: Salad station usually worked 3-11:30 because this station closed at 10. People on salad were responsible for making salads, sandwiches and pasta. We also kept an eye on the soup, chili, and the bakery case. Grill: There are two grill positions, grill and window. The person on grill was responsible for making the burgers and chicken sandwiches and for prepping the flatbread pizzas (we often had a culinary person here, but we could all do it). The person on window was responsible for taking orders, making fries, chicken nuggets and pizzas and giving the guests their food. Dining room: There are 2-3 dining room positions. At night we usually only had 2 people in dining room but in the morning they often had three. The two positions we always filled were the main dining room and the food court. Sometimes there was also a third person who would take care of the patio, trash bins and washing trays. In main we had to clean all the chairs and tables, keep the condiments bar stocked, take out dining room trash, and take trays in the back. Food court had to keep the counters and drink machines clean. Food court also stocked drinks, chips, cereal and the cabinets under the drink machines. If there was no patio person the two would share the patio responsibilities and main would wash the trays. Cash: On cash you had to know the dining plan like the back of your hand, you also spent a good amount of your time stocking mugs. I loved cash because of all the guest interaction. Runner: One of my managers called the runner the heart of the restaurant. The runner was in charge of making sure both the salad and grill stations had everything they needed, from food to plates. They also had to make cookies, keep the coolers stocked and cover the grill when the grill people went to break. If the runner did not do their job quickly and efficiently all of the other stations suffered. Closing was our time to shine. We would do as much pre-closing as was possible while we were still open (this included shutting down a drink machine early or cleaning a grill early etc.) In order to close the restaurant we had to have everything wiped down, wrapped, locked and stocked etc. It was a lot of work, but also a lot of fun! After our manager walked through the restaurant and checked everything we had post-meal in the back and then we all clocked out together. Sara (right) and some of her coworkers! Not at all. It was one of my very bottom picks. I am so happy I got it! I loved it and after seeing what the roles I wanted had to deal with, I would not have wanted any other job. I absolutely loved being able to help guests, I know some people tired of explaining the dining plan, but I loved seeing the look on a guests face when they learned they could get a dessert TOO! I loved being able to make magic left and right. And I loved making wilderness salads. My least favorite thing was cleaning the grills and the Panini grill, or dumping fryers! Dumping fryers is scary because you are carrying boiling hot oil and it is very easy to burn yourself. Most of my managers would not let me dump fryers but I had to do it once and it was the scariest moment of my CP life. I had so many cool magical moments, I don’t know where to begin! One of the cool things about being in a resort was that I was able to get to know our guests because they would come back again and again. One time when I was on the grill I was talking to this sweet couple and I discovered that it was the husbands first time at Disney and he was 50! Apparently the wife had been many times with her family but they had never been able to afford to go, until now. I gave him his first Mickey Premium Bar and gave them advice on what to do that day. They came back and saw me every single day after that. They always got so excited and told me about their day and I’d help them plan their evening or the next day. By the end of their stay they were showing me pictures of their pets and their daughter who is getting married, I was one of the first to see her dress. I looked forward to their visits every day and on their last day there they added me on Facebook. Just kidding, I had known some people who had done the DCP previously and I had always considered doing it. When Sara decided she wanted to do it, I decided it would be a good experience for me as well. I guess I wish I would’ve known more about Disney and the parks BEFORE I got there. I learned so much while I was there, but I think I could’ve gotten even more out of it if I’d had more knowledge of Disney World. Sara unfortunately doesn't have a blog, but if you have any questions you can leave them in the comments below, and I'm more than welcome to ask her myself! Great interview! So what is next? Are you off to more College? Also, Sara said you were sick during the program. Are you OK now?